Industry’s reliance on university collaborations for R&D is no longer just a trend – it has become more like a seismic shift. Innovation-starved corporations are eagerly seeking out university partners, but only those universities that have embraced this shift and prepared their campuses for a new level of integrated industry engagement will reap the benefits. As part of its mission to support holistic industry engagement and assist universities in attracting more corporate partners, University-Industry Engagement Advisor has produced a distance learning collection featuring four leading universities that have used innovative strategies and proven programs to achieve robust relationships with corporate partners. Kansas State University, Brown University, the University of Georgia, and the University at Buffalo are prime examples of how to foster welcoming and comprehensive industry engagement initiatives that result in research funding, job creation, philanthropic funding, talent pipeline development, and economic development. 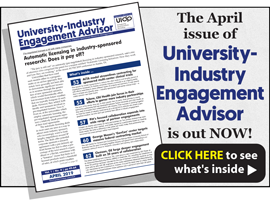 Effective Models of University-Industry Engagement: Case Studies in Success features the details behind each of these program in four in-depth presentations. The collection comes complete with the original program materials and in three formats — DVD, on-demand video, and PDF transcript — so you can listen and share them with your entire staff at your convenience in any format. For complete details on this valuable collection, CLICK HERE.